Wing span: 1 1/4 - 1 3/4 inches (3.1 - 4.5 cm). 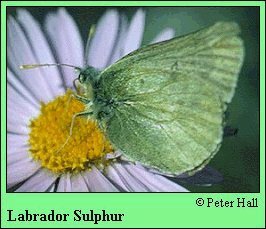 Identification: Upperside of both sexes dirty white or dirty green-yellow; black border contains white or greenish spots. Underside of hindwing has submarginal rows of black spots. Life history: Overwinter as mature caterpillars. Flight: One flight from late June-early August. Caterpillar hosts: Plants of the pea family (Fabaceae) including milk vetch (Astragalus alpinus) and white clover (Trifolium repens). Range: Alaska south in Rocky Mountains to north-central Washington and northwest Montana.